When one buys a ticket to see a classic performance such as My Fair Lady one hopes to be highly entertained and OSF's 2013 production of My Fair Lady does not disappoint. I am often impressed by the simplicity of the stage settings of an OSF production and for this production I think the setting is just about perfect. Two grand pianos (and pianists) are on the stage throughout the entire performance providing all of the music, with one exception; that of a solo violinist who plays beautifully at various poignant points in the story. Theater seats are also on the stage, about a dozen of them, to set the scene of a studio workshop and when not performing the members of the ensemble take their seats. And while at first you might think they are just sitting and waiting for their next cue, they are very much a part of the on-going story in a quiet subtle manner; telling the back story. I was also impressed with the slight costume changes for each member of the ensemble to capture the particular scene. With very simple changes, such as adding gloves, or tucking in skirts to show a different fabric, they set the scene. By far the most entertaining costume change took place as they all gathered at the Ascot races. All of the fabulous hats came down from the rafters and set themselves right on the actors heads. It was brilliant! It is the classic telling of Eliza Doolittle (Rachael Warren) and Henry Higgins (Jonathan Haugen) and how an unlikely relationship changes both of their lives. Both actors are perfectly cast and the on-stage presence between them is played beautifully. Anthony Heald was excellent as Eliza's father Alfred P. Doolittle and his rendition of "I'm Getting Married in the Morning" was almost too much fun as he led the entire ensemble in a stomp dance number. And Ken Robinison as Freddy Eynsford-Hill almost stole the show with his comedic "On The Street Where You Live." 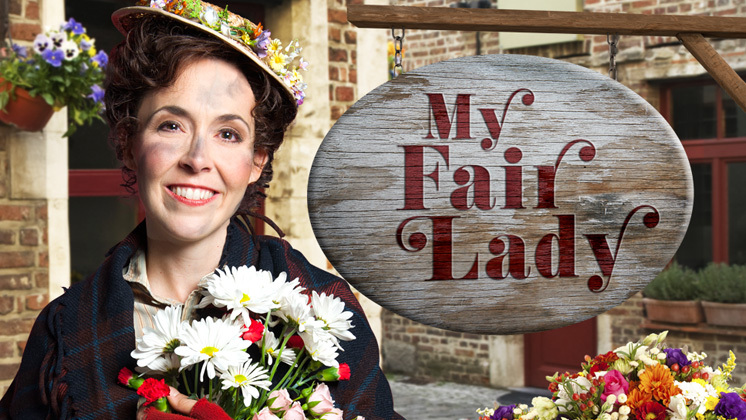 Directed by Amanda Dehnert, My Fair Lady runs approximately 3 hours including 1 15-minute intermission. Sometimes, I feel a 3-hour performance can be a bit long but not this one. This production keeps the audience engaged throughout. The music of My Fair Lady is timeless and if you know it at all, you find yourself silently humming along. As we were exiting the theater I overheard a woman telling her friends it was so nice that such a classic story can still be told in a fresh way. I'd have to agree with that sentiment. If you are coming to Ashland for the 2013 season, do not miss this one. I predict it will be the hit of the season.